Real Madrid will be eager to book a spot in the Champions League Quarterfinals after back-to-back disappointments against Barcelona in the domestic competitions. Los Blancos will be mentally demoralized, but they will also be hungry to throw those despondencies away by overcoming Ajax in the second leg at Santiago Bernabeu today. 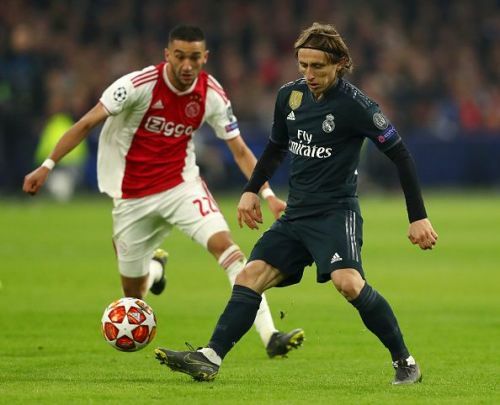 Madrid hold a 2-1 advantage from the first leg in Johan Cruyff Arena, but they know that there is still a lot of work to be done in order to qualify for the next round. Ajax were not the favourites in this tie, but they produced an extraordinary display and were unlucky with some of their decisions in the first leg. Erik ten Hag will be hoping to see his team deliver the exact performance and trouble the hosts who are in complete disarray. Santiago Solari will also know that it will be important to get the first goal in order to calm the atmosphere in the stadium. The side creates a handful of chances, but the failure to stay with total conviction in the final third is costing them. Ajax do have some dangerous players including Hakim Ziyech, Frenkie De Jong, Klaas Jan Huntelaar, David Neres, and Dusan Tadic who have the capability to hurt the reigning European Champions. Marcos Llorente is the only expected absentee for the Los Blancos. Santiago Solari will have an almost fully-fit squad for the first time since he took over the club. Ajax will remain without Hassane Bande, Carel Eiting, and Lisandro Magallan due to injuries. The trio was not part of the squad for the first leg at Amsterdam as well. Real Madrid Skipper Sergio Ramos received a two-game ban from UEFA for his action to deliberately receive the yellow in the first leg. Ajax have not been hit with any suspensions. Karim Benzema is Real Madrid's top scorer and the Frenchman will be looking to add more to his tally when he takes on Ajax on Tuesday. The former Lyon striker was not able to find the back of the net against Barcelona, but he will be coming out with total fierce to make a statement and take his team to the Quarterfinals. Dusan Tadic has been a revelation for Ajax ever since his move from Southampton in the summer transfer window. The Serbian has mustered out eight goals in the Champions League which includes goals from the playoffs. He has been the Dutch side's talisman and will hope to prove his goalscoring prowess against Real Madrid. Real Madrid: Thibaut Courtois, Dani Carvajal, Raphael Varane, Nacho Fernandez, Sergio Reguilon, Casemiro, Luka Modric, Toni Kroos, Gareth Bale, Vinicius Jr, Karim Benzema. Ajax: Andre Onana, Noussair Mazraoui, Matthijs De Ligt, Daley Blind, Nicolas Tagliafico, Lasse Schone, Frenkie De Jong, Donny van de Beek, Hakim Ziyech, David Neres, Dusan Tadic.